The Fall, starring Gillian Anderson, originally aired on the BBC in early May 2013 and appeared on Netflix streaming later that same month. I added the show to my queue when I heard about it then and we finally got around to watching it while snowed in last week. It’s only five 1-hour long episodes so we blazed through it. 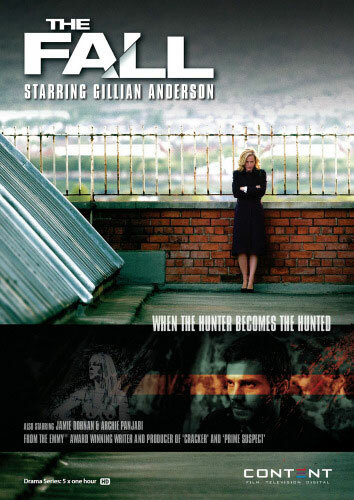 The Fall follows a detective (Gillian Anderson) as she hunts a serial killer (Jaime Dornan), set and filmed in Belfast. The show starts slow, developing it’s bold but relatively small cast. It immediately drew us in with its smart juxtapositioning, which is used both visually and thematically. The detective and serial killer both hunting, scenes cutting to and from each of them as they both perform their daily routines and rituals, showing their similarities by way of control and intellectual strength. Another exquisite thing about The Fall is the clear and powerful theme of feminism. It’s not overt; it builds slowly but undeniably underlies everything about the series. Every female character (detectives, wives, daughters, even the babysitter) is smart, intuitive, strong, calculating, and confident whereas every male character (the serial killer, cops, gangsters) is weak, reactive, fragile, and impulsive. It’s really refreshing to see a drama series, a crime drama series, that has such a formidable female cast (unlike the one offs on Law and Order: SVU, Bones, or Dexter). Speaking of Dexter – any fan of that show will enjoy the serial killer parallels in The Fall. Paul “lives in plain sight,” much like Dexter, with a wife, kids, and a job. His obsession with his victims (young, smart, dark haired, successful professional women) is similar as well, as he stalks them, learning about them in depth before planning the perfect scenario in which to kill them. Also like Dexter he is very careful not to get caught (the cardinal rule) though towards the end he does make some, ahem, mistakes (no spoilers!). Last but not least, Gillian Anderson is superb. She is blatantly sexual but in an elegant way; chic and polished, wearing perfectly tailored clothes and is always tastefully put together. Despite that, she isn’t afraid of being in the trenches, getting close to blood or dead bodies, and isn’t easily spooked. She is calm, level headed, and demonstrates her ability to take control of basically every situation on the show. Long story short – she is a beautiful, whip-smart badass that can run circles around her male counterparts. Despite the fact that there are only five episodes, The Fall never feels rushed. The investigation in search of the serial killer builds piece by piece, as I imagine it would in real life. Every move made by both the police and the killer is intentional and inextricably brings them closer to each other (episodes 4 and 5 definitely have some nail biting moments!). Season 1 definitely ended in a quasi-cliffhanger so I’m very excited for Season 2. Production on the second season is starting this month which means it won’t air for some time – a big bummer but I will be a patient fan for this show.